VANCOUVER, March 27, 2018 /CNW/ - Hannan Metals Limited ("Hannan" or the "Company") (TSX.V: HAN) (OTCPK: HANNF) is pleased to present an update on exploration completed for the last year and announce plans are underway for a major drilling program to test geological, seismic and soil targets on its Kilbricken zinc-lead-silver prospect near Ennis and on other prospects in the group's extensive prospecting licence area in Co. Clare, Ireland. Following a successful exploration program completed by Hannan over the last year, the Company is now planning a 20,000 metre drill program to test geological, seismic and soil targets generated both at Kilbricken and across Hannan's large Clare prospecting licence. Immediate priorities on the regional basin-scale are structural trends evident in seismic data that coincide with seven significant geochemical targets within a 12 kilometre untested trend. Hannan has now made all cash payments totaling US$1,000,000 (€810,000) to Lundin Mining Ltd to complete its purchase of the project. Lundin will retain a 2% net smelter return royalty on all sales of mineral products extracted from the project area, subject to certain buy back provisions. Mr Michael Hudson, Chairman & CEO states, "We are delighted with the progress we have made over the last year since listing. After completing our purchase from Lundin Mining we now own one of the few high-grade zinc-rich sulphide discoveries made over the last decade in Ireland within a strategically important, regional-scale land package. We have established a maiden resource estimate which our drilling has already expanded, while our seismic and geochemical work has unlocked the potential which will form the basis for current and future drilling targets." After raising a total of C$4.8M in February and August 2017, Hannan has quickly progressed to become one of Ireland's leading exploration companies. 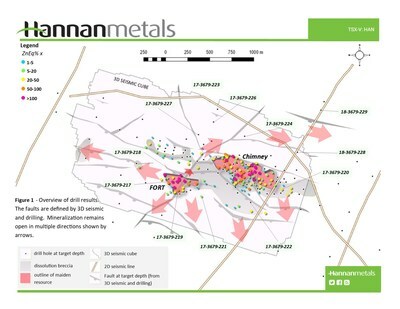 The Irish midlands are a high pedigree zinc district, long favoured by major mining companies due to the presence of large high-grade deposits often with simple process flowsheets and high value low impurity concentrates. Hannan's work to date at the Clare project has focused on the capture of new data, including extensive drilling, geological, seismic and geochemical work programs within its large prospecting licence package. The exploration team has completed all work safely, to plan, and to budget with full community cooperation, and is now planning for follow-up work on a range of resource expansion to regional scale targets with 20,000 metres of drilling, which remains subject to further financings during 2018/19. The remaining eight drill holes of the 2017 program (DH 17-3679-221 through to DH 17-3679-229; DH 17-3679-225 was abandoned at 72 metres) (see Tables 1 and 2 and Figure 1) were drilled outside the Kilbricken resource area, based primarily on soil anomalies. Hole 17-3679-221 intersected anomalous copper mineralization 300 metres along strike from the Fort Zone. Hole 17-3679-226, drilled up dip from the resource area, intersected hematite alteration which is considered a good indicator of proximity to mineralization. Drill hole 17-3679-228 contained both pyrite at the base of reef with intense dolomitization and a fault in the stratigraphic footwall, which indicates a drill target at shallower levels up-dip of from the resource area. The remaining five holes did not intersect significant mineralization or alteration (Figure 1). Geochemical sampling grids at Hannan's Clare County project now cover >200 km2 with a soil sample spacing of 500m x 250m (Figure 2). Over the Kilbricken prospect, a 30 km2 area was covered with a denser grid with 250m x 250m spaced samples. Recent sampling by Hannan now comprises a total of 961 samples and has defined seven new anomalous areas, including a 12km by 2km long north-west trending multi-element geochemical anomaly. Within this trend there are four Kilbricken-sized multi-point anomalies which have never been drill tested, including a southerly extension to the Ballyhickey historic mine (Figure 2). Late in 2017 a 40.6 line kilometre 2D seismic survey was carried out on the Company's 100%-owned County Clare zinc project, which hosts the Kilbricken zinc-lead-silver deposit in Ireland. The regional seismic survey is a first for the area and has delivered a critical new set of subsurface data across Hannan's 35,444 hectare prospecting licence (Figure 1), which will form the basis for current and future drill targeting and prioritization. Combined with earlier surveys Hannan now owns 68 kilometres of 2D seismic and a 1.5 square kilometre 3D seismic survey. Hannan has also invested considerable time processing historic seismic data acquired in 2011 and 2012 by earlier operators, to further refine the structural architecture on the project. Hannan commenced locked cycle metallurgical testwork utilizing the services of Wardell Armstrong late in 2017 and results will be available during Q2 2018. 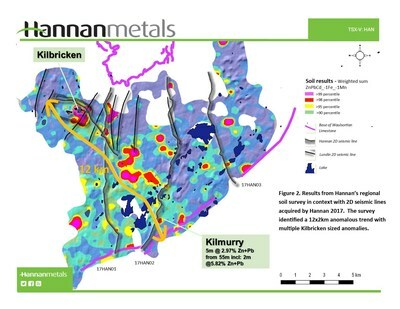 During 2017 the Company announced the results of a gap analysis on mineralogical investigations on the Kilbricken project, Ireland by Dr. Kurt Forrester of Arn Perspective Ltd. Based on this study and the available information, it is likely a conventional lead-zinc flotation circuit at Kilbricken should produce a saleable mineral concentrate. The Company also commenced a formal technical collaboration and agreement with iCRAG at the University College Dublin during 2017. iCRAG is an EU and industry funded research centre with experts in Irish mineral deposits which will aid in geological understanding and targeting of additional mineralization on Hannan's Clare licences. Hannan has now made all cash payments totaling US$1,000,000 to Lundin Mining Ltd to complete its outright purchase of the project. The project was assigned to Hannan, and was acquired, effective September 21, 2016, pursuant to an Assignment Agreement between the Irish Minister for Communications, Climate Action and Environment, Hannan and Lundin Mining Exploration Limited ("Lundin"), a subsidiary of Lundin Mining Corporation (TSX:LUN). Under a separate Asset Purchase Agreement, dated June 3, 2016, Hannan purchased all exploration data associated with the project from Lundin for a cash payment of US$150,000. Hannan has now made two additional cash payments to Lundin of US$425,000 each in September 2017 and March 2018. Lundin will retain a 2% net smelter return royalty on all sales of mineral products extracted from the project area, subject to a 0.5% buy back right of Hannan for US$5,000,000, which must be exercised within one year from the date of commercial production. Hannan is required to pay Lundin a one-time bonus payment of US$5,000,000 within the earlier of (i) Hannan Ireland's decision to proceed with mine construction or (ii) within 90 days of the establishment of a commercial financing to finance capital costs for mine construction. Table 1: Highlight intersections Hannan first year of drilling at the Kilbricken Project, Clare, Ireland. Note 1: The zinc equivalent (ZnEq) value was calculated using the following formula: ZnEq% = Zn % + (Cu% * 2.102) + Pb% * 0.815) + (Ag g/t * 0.023) with assumed prices of Zn $2587/t; Cu $5437/t; Pb $2108/t and Ag $18.44/oz.